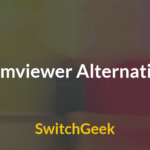 Feeling bored and tired of seeing your basic laptop screen and desktop settings?? You can turn your laptop screen simply by changing its skin according to your choice and mood. Ohh yes… You read it right. Get ready to explore and experience some of the awesome guide designs with rainmeter. 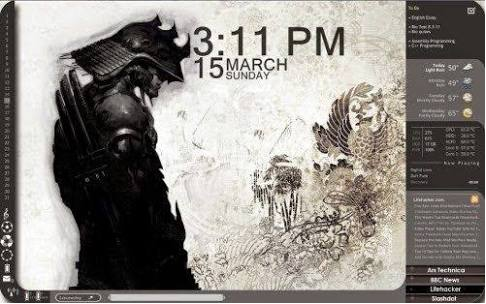 Rainmeter are free and open source application that can be installed in Windows PCs. It has its suite and design which gives your desktop screen a new look by creating visual elements in the window skin such as frames, background, image, border, chart, text, buttons, etc. and make it beautiful. So, if you are looking for the best Rainmeter Skins to change your desktop world then here are Gorgeous Rainmeter Skins for you. What is Rainmeter Skins and How to install on your PC? Download the Skins and the packager from the browser. You can see the icon shows Rainmeter Skins Installer (.rmskin extension). Select or add some settings like skins, layouts, plug-ins, fonts, add-ons, etc. Finish and install the skin. There are numerous skins for your mood and of your choice to change your desktop most interestingly. 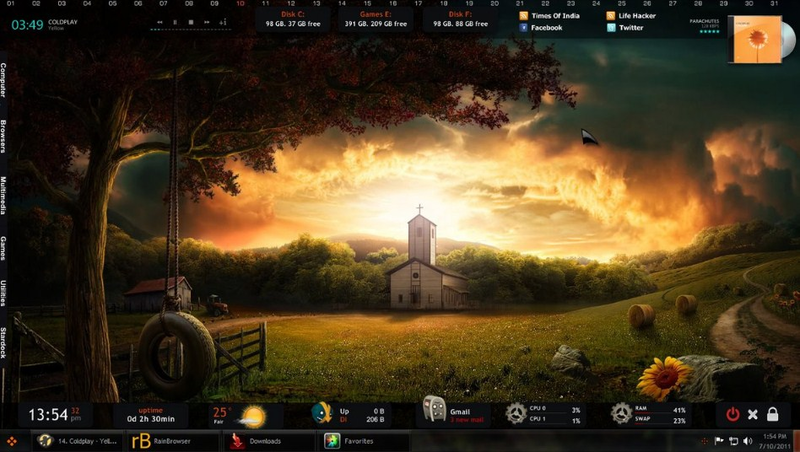 So, have a look on these 25 Gorgeous Rainmeter Skins and apply them on your window screen. 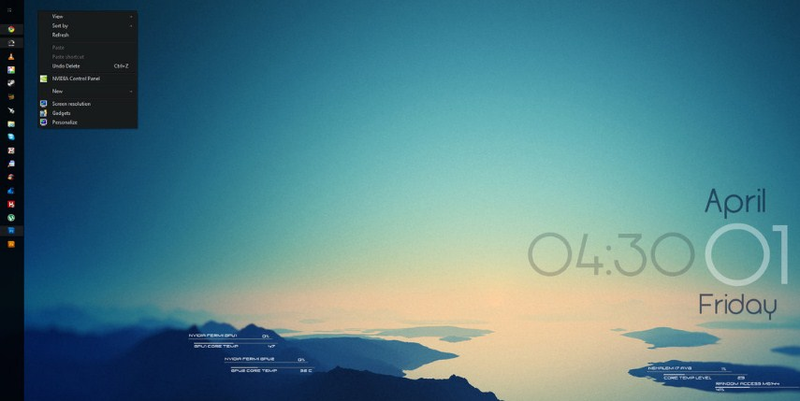 This Rainmeter Skin looks so irresistible as it has a beautiful background designed smartly. The widgets and icons are arranged in step-like structure on a window screen and on the top of the screen, you can set icons according to your choice. 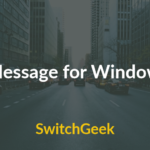 The unique and beautiful arrangement of the icons and the management of the screen, Windows 2019 is enriched with different features which obviously does not include the boring bar arrangement. The large icons and bars are arranged on right side of the screen, and instant on/off button and other instant files occupy the little-left corner of the screen. 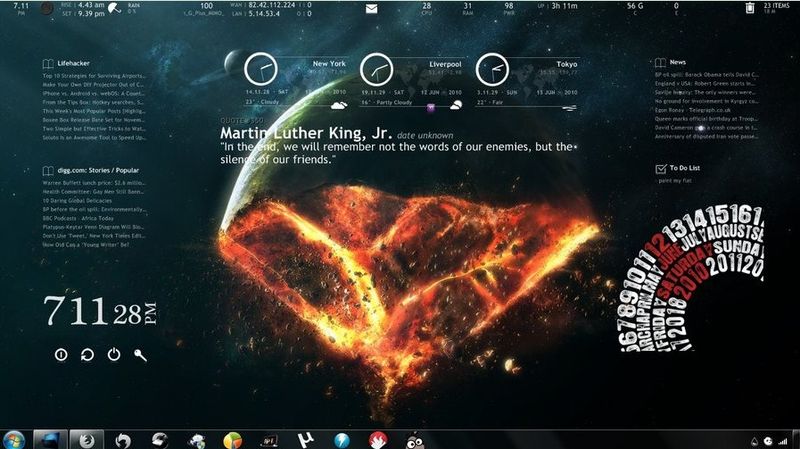 If you are a great Iron Man fan, then you gonna like Jarvis and Shield Rainmeter Skin. 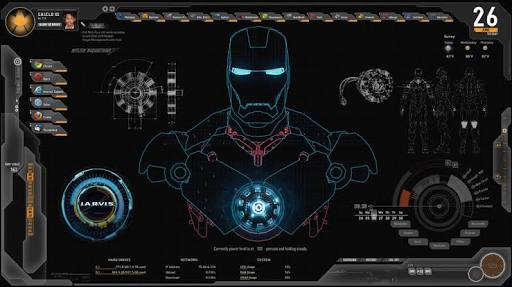 It simply turns your desktop screen into the Ironman and Shield look and arranges your widgets and icons in a way that looks so smart and arrayed. 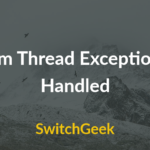 It is supportable in Windows 7, Windows 8 and Windows 10. It has many widgets and customization options. Like its name, the theme highlighted the background with beautiful dark scenery besides your interface. This dark background engraves that attention who loves dark interfaces. Darkness Fall Rainmeter Skin changes every icon, wallpaper, widgets into the dark mode. There is an icon which shows instant on/off button and many other features. You can customize the widgets and icons according to your choice. 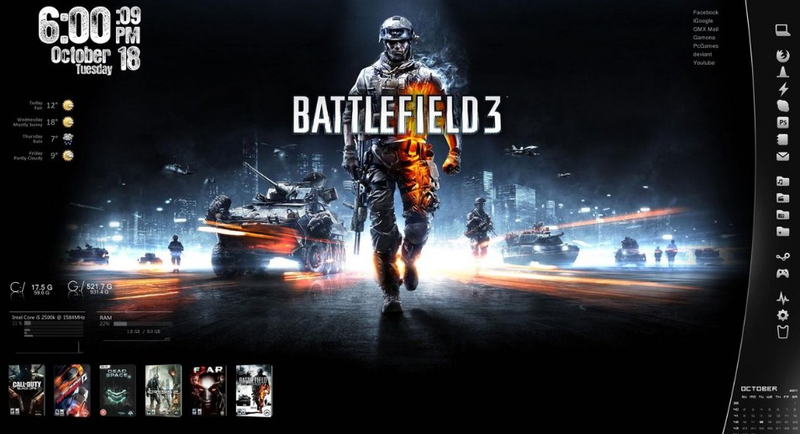 Battlefield 3 is a game based theme Rainmeter Skin which is designed mainly for gamers. The icons bar is set on the right side of the screen in a very good manner and look so perfect. On the top edge of the one side of the screen, it shows clock, weather and calendar and bottom it has some instant executing icons. You can select and customize icons according to your choice. 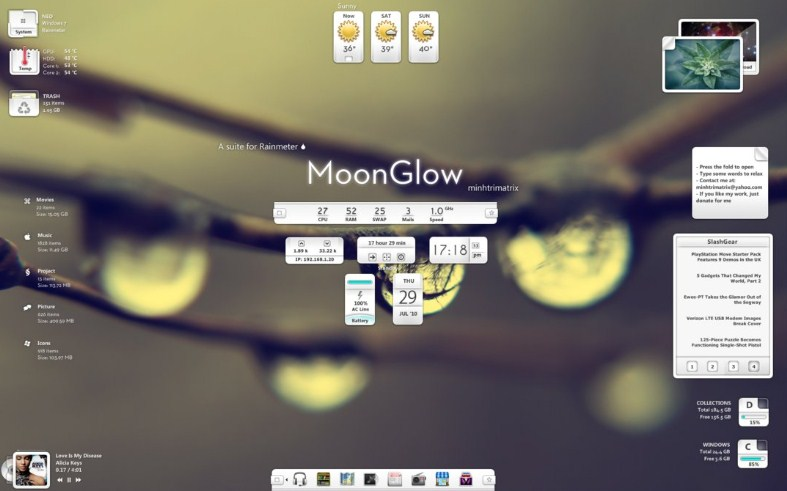 Moon Glow is the soft and beautiful Rainmeter Skin which has a moonlight bulbs background and midnight glowing screen. In this theme, the clock, weather conditions and calendar is set in the middle of the screen which is movable. The other icons and bars are arranged in every corner of the screen perfectly. You can choose and customize icons easily by dragging the icon on the screen. It also shows the live notifications of your mailbox which ease the access. 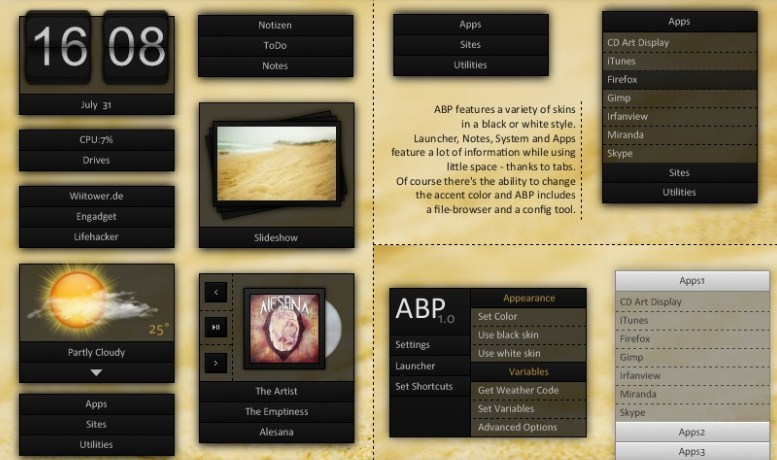 ABP is a very simple and easy access Rainmeter Skin which is the best choice for the beginners. The arrangement over the screen makes the execution facile. The icons and widgets are arranged in different bars, and there is an additional icon containing three sub-icons in which you can add apps according to your choice. You can customize the theme and color of the skin and make it more creative. Orange Glow has the excellent color combination of the screen which shows screen orange in color with dark effects. This is the beautiful Rainmeter Skin for your desktop. It covers the whole screen which arranged with the frequently used apps, widgets, and other icons. You can change and customize the theme and icons according to your choice. 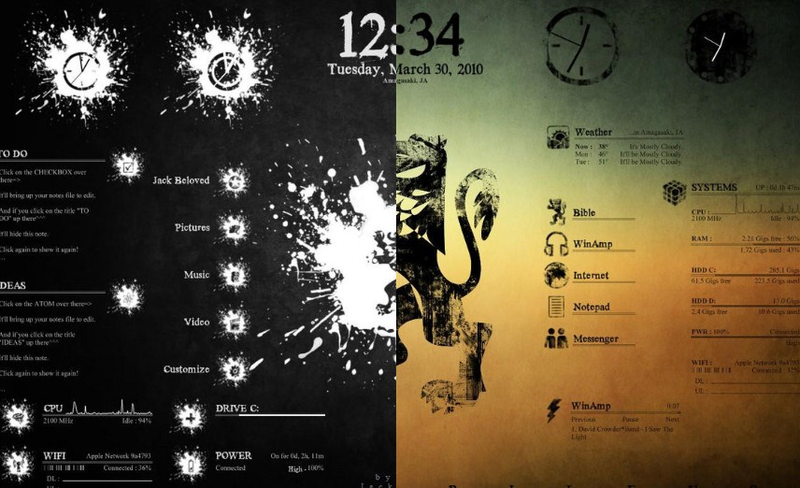 The Morph is the simple Rainmeter Skin which gives you the classic effect in which the icons and widgets are arranged in a shelf and tray manner. It looks beautiful and attractive in its originality. You can customize the structure of the arrayed items and the icons as well according to your choice. The theme with the light-dark background, Before Dawn, gives your screen the coolest and refreshing effects. This is the light-dark background theme based Rainmeter Skin includes beautifully arranged icons in the front view of the screen. It also shows the frequently used icons and bars. You can customize the screen view according to your choice as well. If you love classic theme and style, then Switching would be your first preference. Switching Rainmeter Skin is the classic theme based skin which has faded background and nicely arrayed icons which is presented in a classic theme on the desktop screen. It shows a bar containing drives and other shows the time, weather conditions and calendar. On the top of the screen, there are icons arranged for frequent use. Encoded is a very different themed Rainmeter Skin which contains four colors interface that is black, white, gray and red. A unique feature is that it shows different color bars with the same widgets and icons on the desktop screen. There is already added a music player with the instant play and pause buttons, also shows clock, weather conditions, and calendar. You can add and customize the icons. 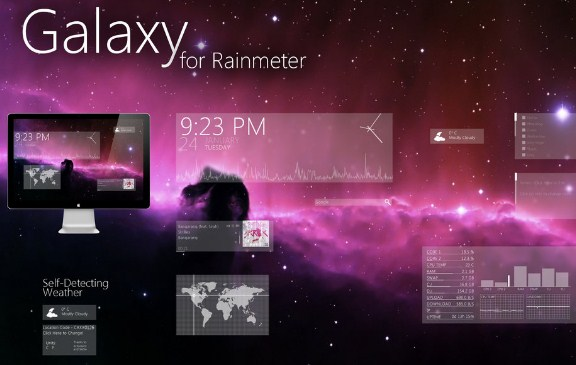 Galaxy Suite Rainmeter has the galaxy background with visual interface effects on Windows screen. It is the universal related theme. The galaxy themed background looks amazing. The time, weather conditions and calendar appears on the screen along with the other icons, widgets and other frequently used apps. You can easily customize the icons and files. 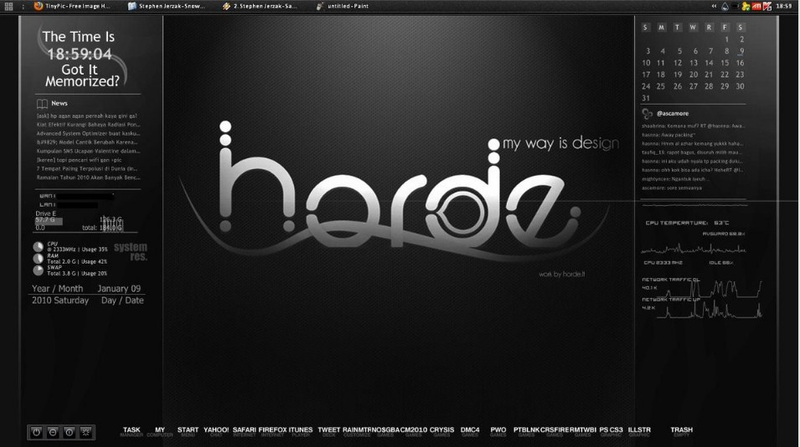 Horde is a classic and dark theme based Rainmeter skin which is simple in access and easy to customize. 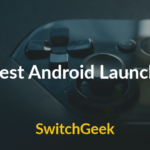 It has user-friendly interface besides amazing quick app launching features. You can change the style of your clock, weather icon, and calendar. This simple theme contains nothing extraordinary in this skin pack. You can customize and add the icons according to your ways. 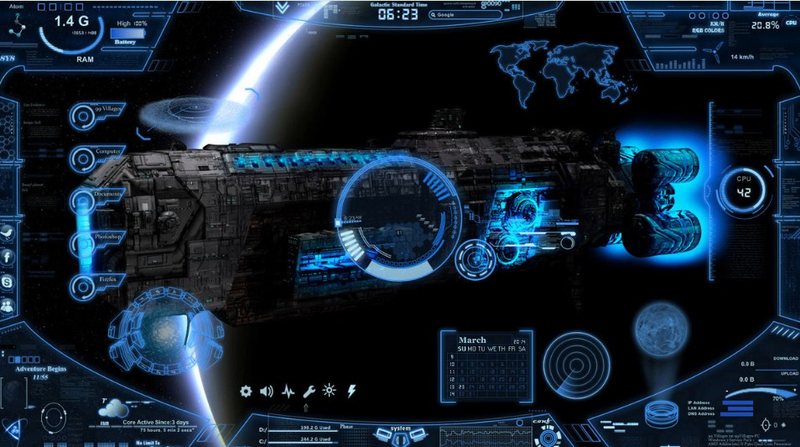 If you are imaginative and a space science lover then you will love this Rainmeter Skin. Space is the space theme based skin which satisfies the need of a space science lover. It has space-related visual effects, and your screen appearance looks so amazing as it turned the theme in night time and dark wall. All the icons, bars, widgets are arranged in the space theme style. An Aero theme based Rainmeter Skin, which was the dream of most of the people always looked for Aero themed wallpapers. For this skin, many wallpapers and themes come along with this skin to which you can customize the screen according to your choice. 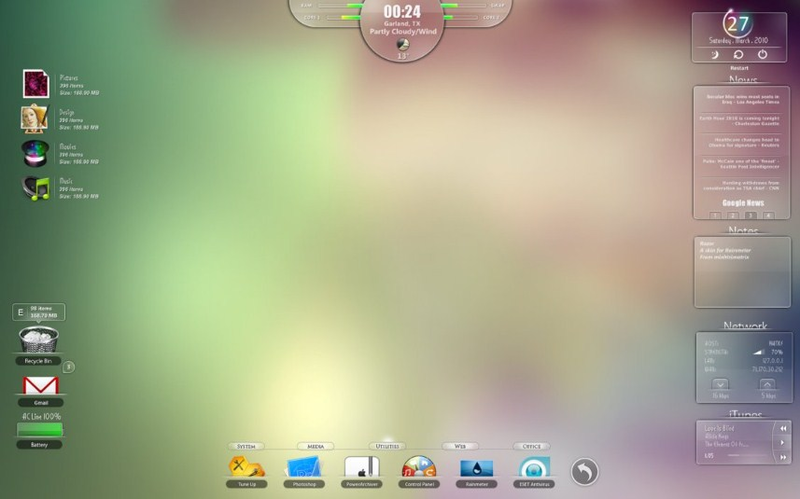 Icons and widgets are arranged on both sides of the screen. 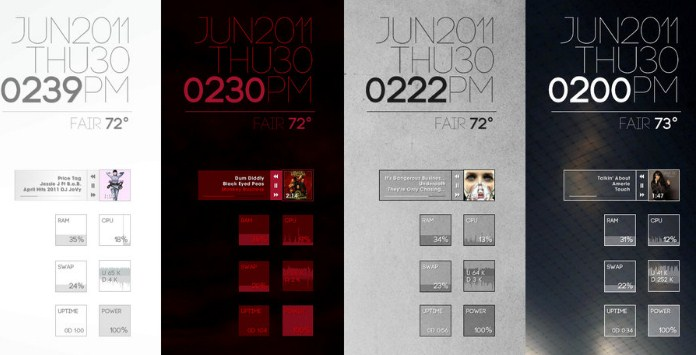 It shows time, weather conditions, calendar, music player and many widgets on the single screen. Imagine the cluster surrounded by the spindles. Yes! 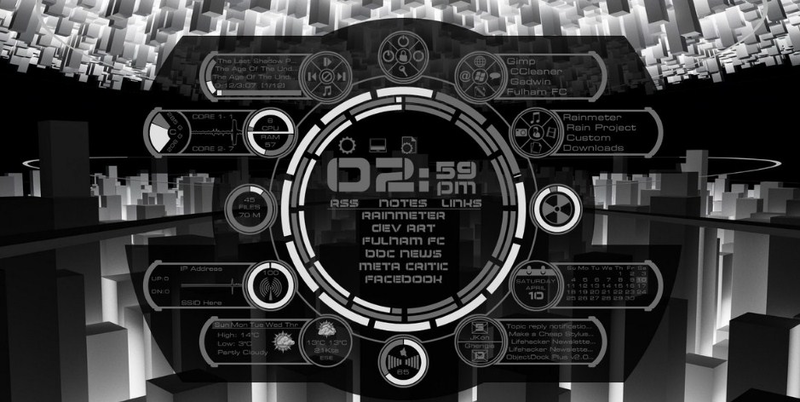 The Pog Pack is the cluster theme based Rainmeter Skin which shows clock, weather, and calendar in the center of the screen and other icons and widgets in the bars surrounding the cluster. You can customize the bars according to your choice. This cluster-based theme sometimes looks like a sports car. Razor is the simple, clear theme with the live view. This is the crystal clear skin which refreshes your mood and changes the environment of your desktop as well. The time and weather appear on the top, live notifications of your mail with other icons on the left side of the screen, some other icons occupy the right side of the screen, and in the bottom, some of the apps and icons are arranged for frequent use. Eker Line Rainmeter Skin is the beautiful and simple theme as the light green background gives you a crystal clean visuality on your desktop item. The icons are arranged and packed in the black bars which ease the differences and easily visible. You can customize the bars according to you by choosing the widgets and icons of your choice. The dark and black bars over light color background looks awesome. 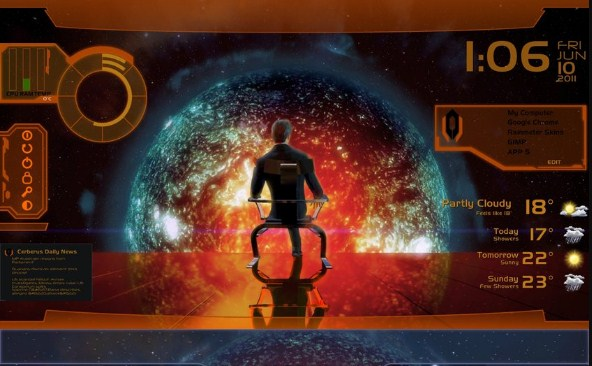 End Of The World is total imagination and creative theme based Rainmeter skin. The wallpaper and theme used in the skin shows destructive features and dark imagination after this creation. 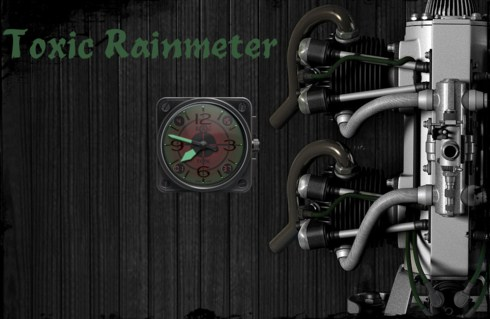 This Rainmeter Skin caught the glances of those who are creative and wild thinkers as it is the imaginary scenario. You can customize the icons, clock, calendar, files, accounts, and bars according to your choice and demand. Pileus Suit is the art based theme. It has different color effects which turn the whole screen into the painted view. Pileus Suit has some extraordinary features like showing CPU usage on the desktop screen. It looks so fantastic with its visual effects and no doubt that it should be the first choice of an artist. A simple and unique theme based Rainmeter Skin, Toxic has nothing extraordinary. It contains the wallpaper which perfectly matches the Rainmeter gadgets and shows CPU and RAM meter. It shows the clock in the center of the screen, weather conditions and calendar on the top of the screen. Raleway Skin is the nature-based theme with a simple interface Rainmeter Skin. It shows live notifications, birthdays, time, date and weather conditions on the screen. Some of the icons and widgets arrayed in the center of the screen in the shape of upside down triangle which can be customized according to your choice. It contains simple and beautiful wallpapers. Rising Reflection Interface gives a view of the very early morning, so basically, it is early morning based theme Rainmeter Skin. It gives you chill to your eyes as this skin color perfection is so beautiful and light. The date, time and weather conditions appear on the right side of the screen, and some icons occupy the left side in a line bar of the screen. A notification bar is showing on the top edge of the left side of the screen. 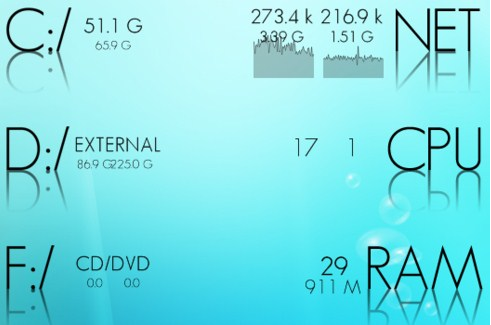 Geosans 2.0 Rainmeter Skin is a very smartly designed Rainmeter skin which is textual bathe sed theme. The colors on the skin has dual visual effects which look nice. The drives, CPU and RAM meter arranged on the left and right side of the screen in a textual way. On the side of the icons arranged on the right side of the screen, there appears the time, date and notification bar. So, these are 20 Gorgeous Rainmeter Skins with some other skins you can look for more taste and features. Hope this article gave rest to your searches for the Rainmeter Skins of your choice and desire. You can share your experience and suggestions regarding this article on the comment section below. How to Download and Install iMessage for windows 10?